Oil & gas is an all too familiar route for energy, however, there remains alternatives. This text was written by Maurice B Dusseault, PEng, University of Waterloo. He is part of the Waterloo Institute for Sustainable Energy, which is a member of CanGEA. Deep geothermal energy extraction requires a method to take heat from the rock and bring it to the surface where it can be used. In wet geothermal reservoirs, there is hot fluid that can be produced, usually without the need for well stimulation methods. This is because the rock mass is permeable enough (pores and natural fractures) to withdraw fluid, strip the thermal energy at surface, and reinject the fluid at a different wellbore. Generally, high quality geothermal resources are considered to be wet reservoirs, and there are such reservoirs in BC and YK, and deep in the sedimentary basins of Alberta and Saskatchewan. In hot dry rock geothermal development, there is little porosity and insufficient permeability to allow circulation of fluids at economic rates, so the rock mass must be stimulated. This stimulation is done by hydroshearing or hydrofracturing (hydraulic fracturing). These three principal compressive stresses are oriented at 90° to each other, and in the fluid-filled pore space and natural fractures, there is also a pore pressure, usually referred to as po (initial pressure). The rock mass at depth that must be stimulated to implement heat recovery is naturally fractured, and these are called joints. 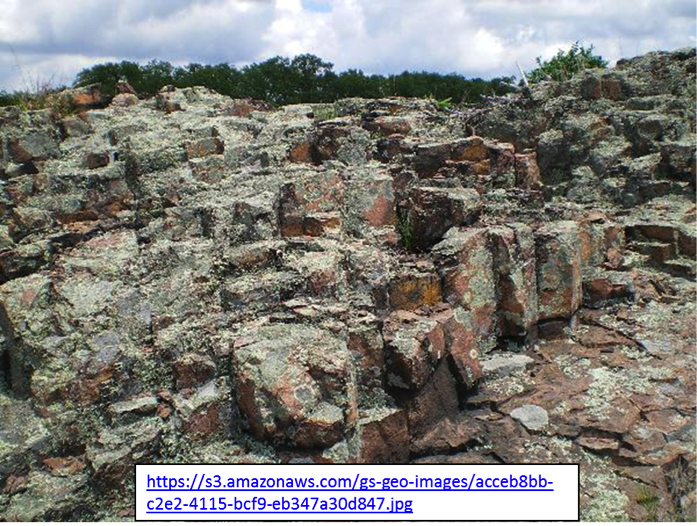 If the rock mass is an crystalline rock (igneous or metamorphic), these joints arose during the cooling of the rock and the slow process of erosion that brought the rock closer to the earth’s surface, and was affected by the tectonic stresses. Joints usually occur in regular patterns, but they can also appear almost random in orientation and length. Joints are easily seen at the surface where weathering and stress relief have opened and exaggerated the natural fractures. However, these joints are largely closed at greater depths because of the high compressive stresses, so the permeability is too low to allow circulation of fluids for heat extraction. The injection pressure that is maintained during hydroshearing by continuous pumping is close to the minimum stress in the ground (usually σhmin), perhaps 95 to 99% of its value – so pinj » σhmin. During hydroshearing, the flow rate and pressure are carefully monitored to sustain the shearing process and allow it to propagate slowly outward. Each shear displacement event shown above is not a gradual process; it takes place as a “stick-slip” event accompanied by the emission of small bursts of seismic energy, called microseisms, or microseismic activity. These are like earthquakes, but because they generally are never felt at the surface, they are called “microseismic events”. The propagation of the hydrosheared zone can be tracked as it moves outward by recording and mapping these microseismic events, so it is possible to learn a great deal about how the deep rock mass reacts. This information, along with pressure and flow rates over time, aids in the design of future activities and decisions as to whether hydroshearing or hydrofracturing is the better option in particular cases. Of course, for geothermal development, it is necessary to improve the permeability, so the propping material that is added to the hydrofracturing fluid during high pressure injection is coarse-grained. 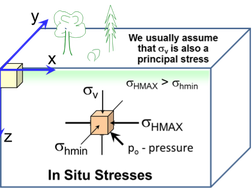 Then, the propped fractures retain a high fluid conductivity, and the overall permeability of the rock mass is enhanced. It is possible, with proper fluid design and aggressive injection, to open joints and prop them to distances of about 100-150 m from the injection point. Much more than this requires such large volumes of fluid and proppant that it may not be economical. Different strata will respond differently because of differences in the extent and openness of the natural fractures, the difference and directions in the natural stresses, differences in the mechanical properties of the rock, and differences in the rate and properties of the injected fluid. These must be understood to achieve good results in geothermal stimulation of low permeability igneous rock masses, and in linking adjacent wellbores. Also, how can one increase the extent of the hydrosheared zone? That is a story for another day. But remember, success in geothermal development depends on economic and effective drilling and accessing the energy, whether it is hot fluids in permeable rock or the heat in hot dry rocks. With ingenuity, we will access the great amount of heat at depth in an economic manner, sustainable, and highly useful in our cold climate. Maurice is a teacher and researcher in the University of Waterloo, and is interested in the geomechanics of anything deeper than 200 m. He may be contacted at mauriced@uwaterloo.ca. Maurice and several colleagues, Dipanjan Basu and Roydon Fraser, are investigating the potential for hot dry rock geothermal deep in the crystalline rocks that underlie many northern communities such as Yellowknife, Cambridge Bay and Iqaluit.